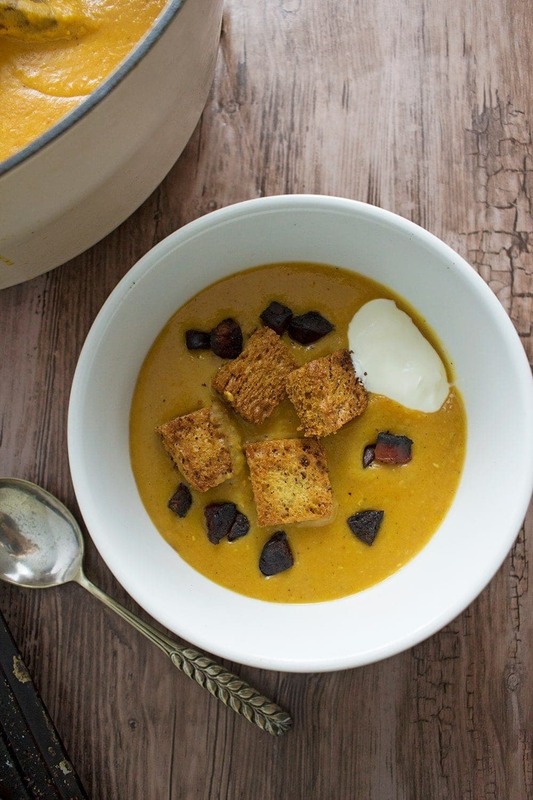 Sweet potato soup spiced with ras-el-hanout and topped with sumac croutons and crispy chorizo. 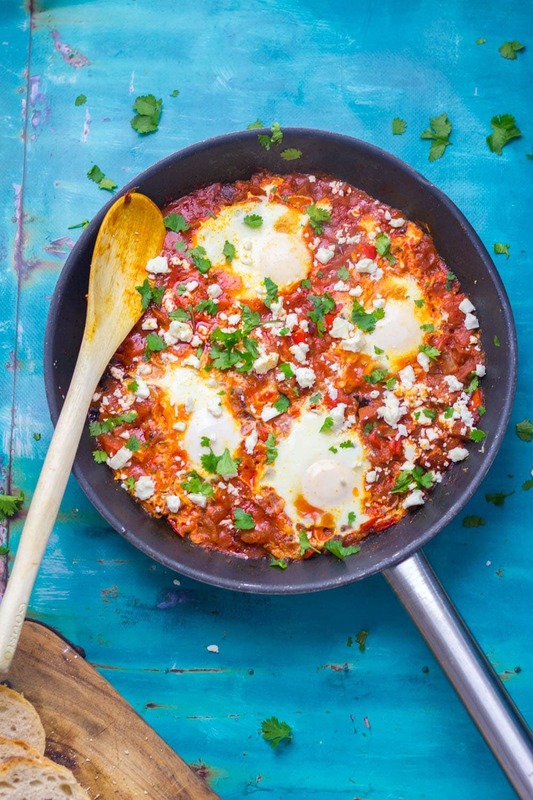 Finish off with a dollop of yoghurt for a filling winter meal. The moment it ticked over to November it was suddenly freeeeezing. It’s depressing in a way, I genuinely think I’d forgotten what cold felt like. Suddenly I have to get used to frozen fingers and toes again. Rubbish! But the thing that unfreezes fingers is holding a big bowl of steaming hot soup. Luckily I have one of those for you today. 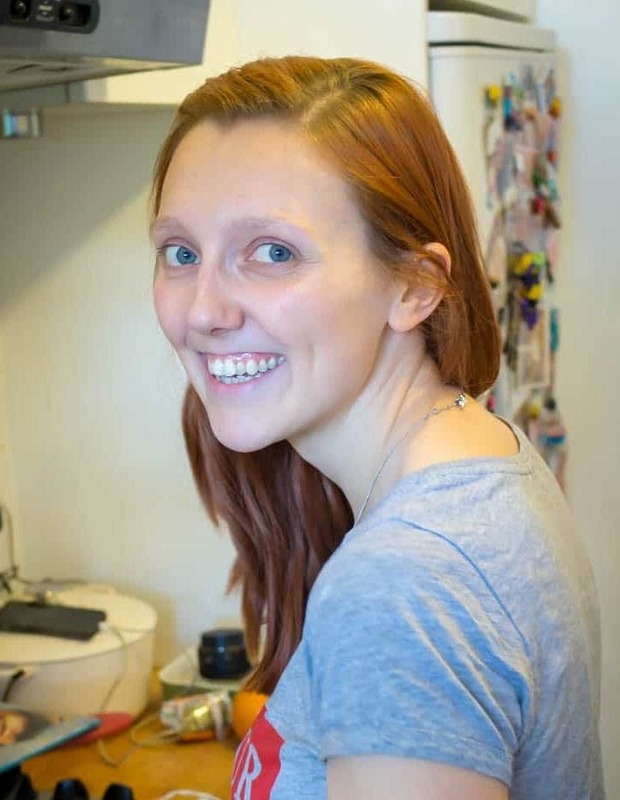 You want some soup don’t you? 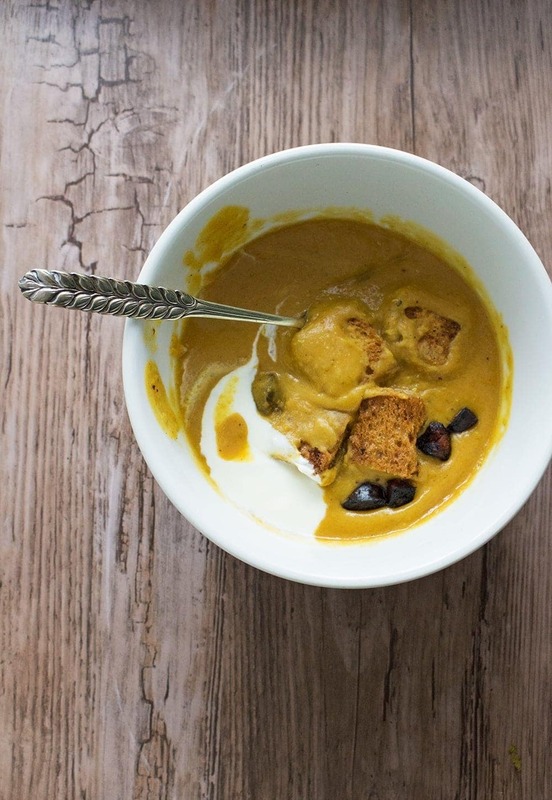 How about spiced sweet potato soup? And you can even chuck on a couple of croutons tossed with a sprinkling of a zingy sumac. Or how about some crispy fried chorizo. Or even better, both! 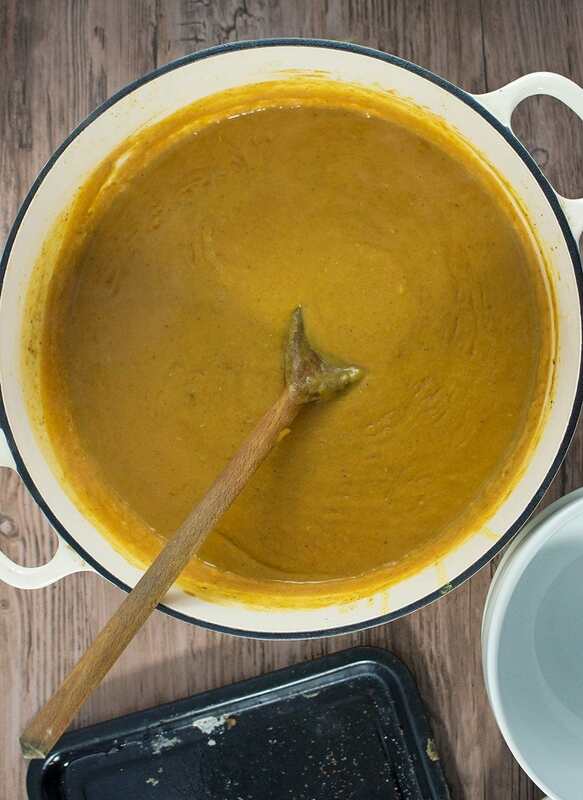 I’ve been making a curried version of this sweet potato soup for years. It’s one of the best comfort foods and it fills you up real good thanks to all those carbs. The other night I was trying to work out what to make Will for dinner before he went out and I couldn’t get this soup out of my head despite the fact Will hates having soup for dinner. Unfortunately for Will I decided I wasn’t going to give in to his bizarre anti-soup sentiments. I figured I’d mix it up a bit this time round and go for a ras-el-hanout spiced soup this time. Croutons always make soup better so I threw some in the oven and then tossed them with sumac. One final thing was needed, a handful of chopped chorizo fried in a pan while the soup was cooking. Throw it all together with some cooling yoghurt and you’re ready to eat! Make sure you keep the tray of croutons and chorizo next to you all the way through so you can keep adding toppings, that will make or break your meal, trust me. Want more? Get all my other soup recipes before you go. WONDERING WHAT TO DO WITH THE LEFTOVER INGREDIENTS YOU’VE GOT FROM MAKING THIS SPICED SWEET POTATO SOUP WITH SUMAC CROUTONS & CHORIZO? Preheat the oven to 200°C. Heat the oil in a large soup pot over a medium heat. Add the onion and cook for five minutes. Add the sweet potato and garlic and cook for another 5 minutes then add the ras-el-hanout and a good helping of salt and pepper and cook for 2 minutes more. Pour in the stock and lentils and bring to the boil. Cook for 20 minutes until the potatoes are tender. Blend the soup until smooth then return to the heat and add the coconut milk, check for seasoning and keep warm until ready to serve. Cut the bread into cubes and place on a baking tray with a drizzle of olive oil. Place in the oven for 8-10 minutes until crispy and brown. Remove from the oven and sprinkle with sumac. Toss. 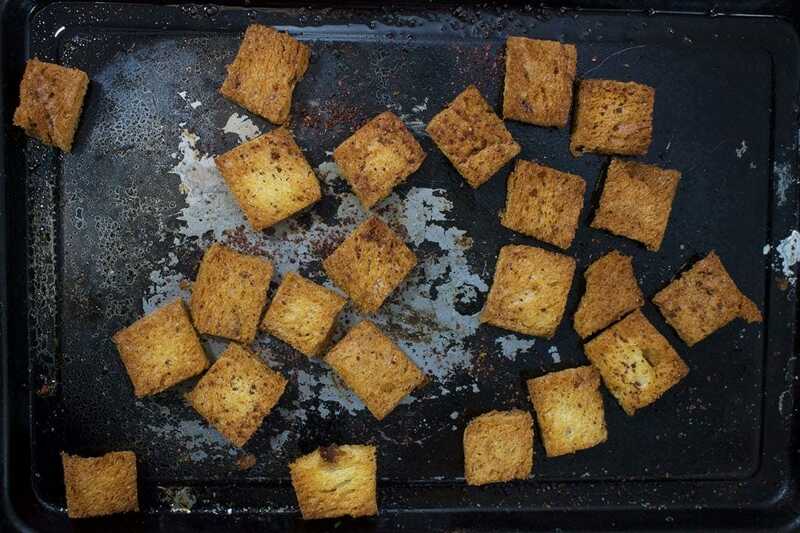 While the croutons are cooking heat a drizzle of olive oil in a small frying pan over a medium high heat. Add the chorizo and cook until crispy. 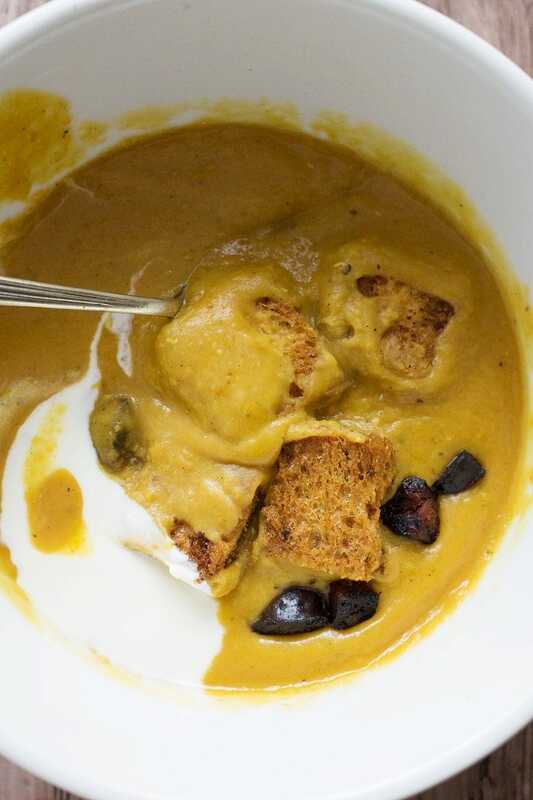 Serve the soup topped with the croutons, chorizo and a dollop of yoghurt. This will be delicious when the weather gets cooler, although that won’t be for a while here. Pinning for later! 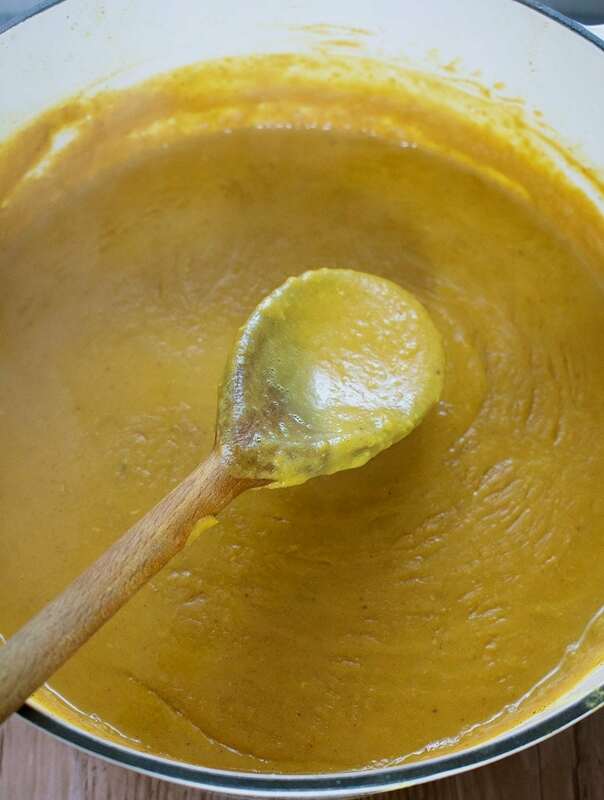 I make a curried sweet potato soup but I’ve never tried ras el hanout. That’s a great idea! 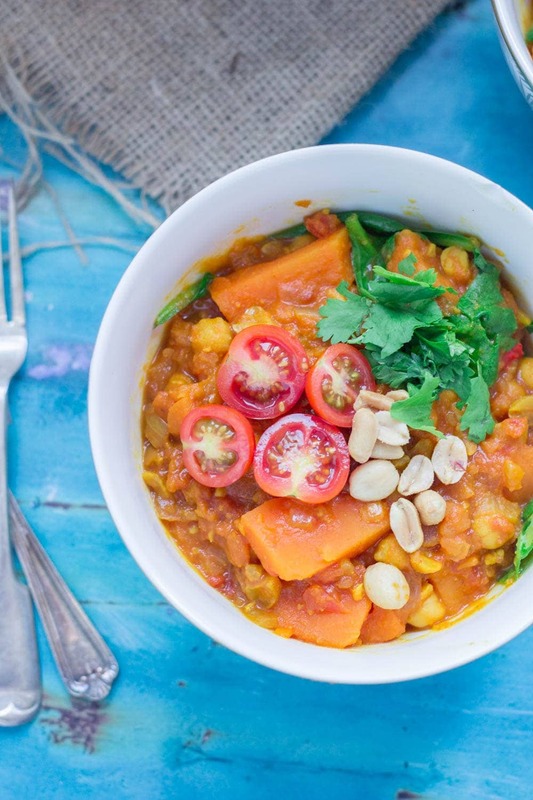 This is just oh-so-delicious and comforting, and perfect for when the weather turns any day now! I love soup anyway — but the chorizo sends it over the top for me! Hearty, warming and seriously gorgeous.